T-Mobile often makes a big deal about the benefits of 5G and what it’ll enable, like better Internet of Things products, in addition to the lower latency and faster speeds that mobile devices will see. And now it’s going on the road to help people learn more about 5G. 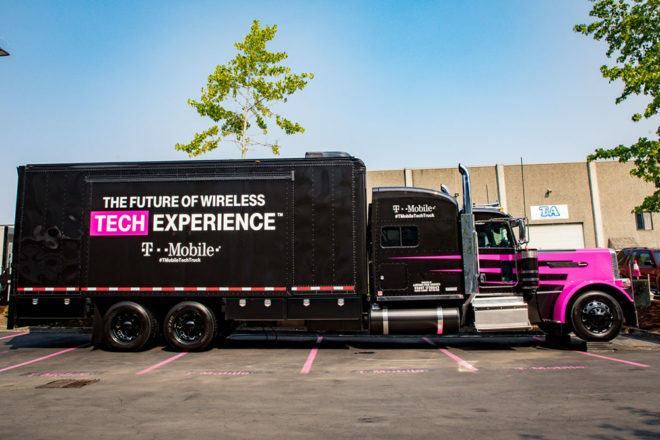 The T-Mobile Tech Truck hit the road today, beginning a journey that’ll take it across the country to help people experience the benefits of 5G as well as other tech being developed by T-Mobile. The exhibit will include connected drones, interactive displays to show how smart cities will become cleaner and more efficient, and AR and VR experiences that T-Mo says will improve how we communicate. All of these experiences are loaded up on a semi-truck that’ll be making dozens of stops in cities across the U.S. over the next 12 months. The truck began its travels in Bellevue, WA today and will use the hashtag #TMobileTechTruck so that you can follow it and see where it stops next. T-Mobile has said that it plans to begin deploying 5G coverage in 30 cities in 2018, including New York City, Los Angeles, Dallas, and Las Vegas, and T-Mo expects to launch its first 5G smartphone in 2019. T-Mobile’s goal is to have nationwide 5G coverage in 2020. It’s said that it plans to use 600MHz and mmWave spectrum in building out its 5G network. Since T-Mobile will be using their 600 MHz spectrum for 5G and since Oklahoma, Kansas, Missouri, and New Mexico were the first places they fully deployed that spectrum, it would make sense that those areas would be among the first to get 5G, but with this truck’s itinerary only including coastal cities for the most part, those current places with Band 71 will probably be among the last to get it, just as they were the last place to get LTE. We hope that is not the case. With coastal cities still hampered by television stations that need to be relocated, they should go ahead with where the 600 is usable rather than making those places wait. T-Mobile can gain some valuable information on how well 5G works and any problems that might exist. Man, you can drive over there for hours without a signal…or seeing another car or person. Maybe if they minitower-collar the cattle. That used to be the case, but not any more. T-Mobile has quite aggressively deployed their 600 MHz spectrum over the entire region. They were not limited by TV stations that had to be relocated, so the deployment went very rapidly. They have also added a lot of brand new sites. I have done a lot of mapping for Cellmapper, you can see my results on that site as well as what has been done by many others. T-Mobile is no longer an also-ran in middle America, not at all. I live in Dallas, but travel to Oklahoma, Kansas and New Mexico frequently. In the past 12 months, areas that historically have had no service now have very strong LTE service. It may be easier to deploy 5G in the less populated areas of the country, but that won’t provide the greatest return on investment. T-Mobile needs to deploy where their customers (and potential customers) are, the population dense coastal regions. It will also give them the ability to advertise “Our 5G Network Covers 9X% of the Population,” etc, much faster. That said, this all might change if T-Mobile is able to leverage 5G as a rural broadband provider and beat VZ and ATT to market with it. The problem with that is that most of the high population markets are not served with 600 yet so they have to put the 5G where it can be used instead, unless they do it with millimeter wave spectrum, but they haven’t deployed that yet either. LOL nah I’m pretty happy with the 85 Mb speeds I’m getting from T-Mobile on Band 71 right now. It would be nice but I will be in the middle of my phone upgrade cycle before the are any 5G phones anyway. Hope they use the truck to map out the weak points in their network. I-5 south of Stockton, north of L.A.: dead spots particularly at gas stations, truck stops near Bakersfield and Coalinga. They already do this with multiple vans full of testing equipment. I don’t know what good this would do, because it’s only taking major highways, for the most part.